For this Christmas card I started with an aqua base cut to open at the bottom. I added a piece of white card stock to the top and a piece of aqua dot patterned paper to the bottom. I punched a strip of aqua card stock using the Doily Lace Edge punch from Martha Stewart. I added it across the card and added a white ribbon and bow across the top of it. I stamped the sentiment directly onto the white card stock and colored the stars with Spectrum Noir pens. I added pearls to the bottom corner and added crystal stickles to the sentiment. Bloggers not playing the game with me today Mary and showing no photos so only seen the thumbnail on the challenge blog, but looks like a lovely cold and frosty creation. Thanks so much for joining in at Allsorts. 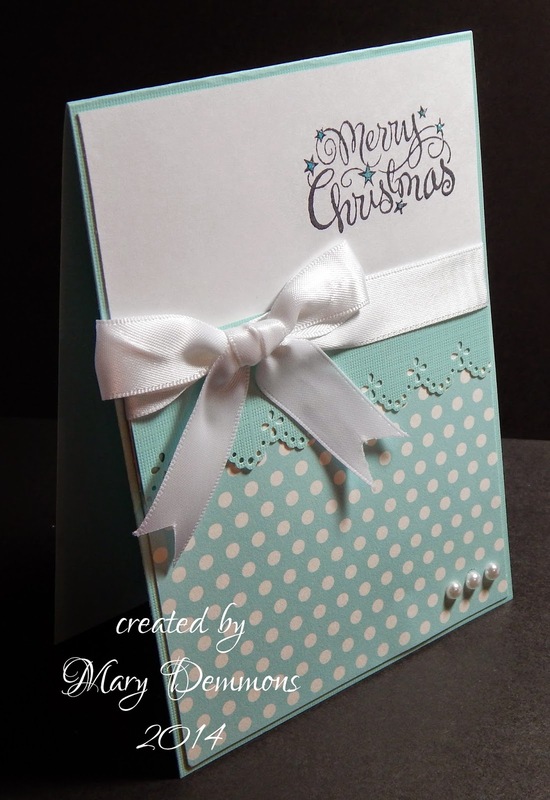 Lovely and stylish card in frosty blues. Thanks for sharing at Allsorts.